A few hours before officially ringing in the New Year I heard a story on the radio about a man who died and came back to life. He was running some kind of race–a marathon, I think–and as he crossed the finish line he collapsed. But a valiant doctor wouldn’t give up. She kept the CPR going long after others told her it was hopeless. And despite the odds, his heart sprung back to life. His heart stopped again (and was revived again) in the ambulance on the way to the hospital. Once there they opened him up and unblocked his arteries. Life surged on. For as long as I can remember I’ve been captivated by such stories and I’ve finally figured out why: I trust them. I trust them because there’s a universal theme present, a shared experience that’s almost always the same in these stories. I trust them because the universal theme and the wisdom embodied within these stories makes more sense to me than the do more/have more/be more mantra that we’re all familiar with. I trust them because when people have been to the edge and back their perspective on what truly matters changes and they carry a deep-in-their-bones connection to the life force. They find hope and joy in the small moments. They unhook from hyped-up definitions of success and making it. Those who’ve been to the edge and back have a lot to teach us about living deeply. 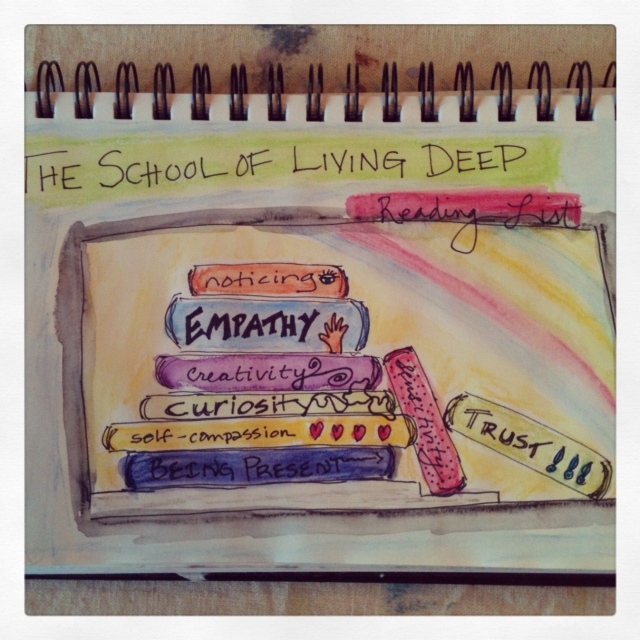 What if there actually was a School of Living Deeply, taught by those wise ones who’ve been to the edge and back? I’d sign up in a precious heartbeat. Of course, tuition wouldn’t be cheap, but I’d be willing to pony up what they’re asking for: trust, empathy, noticing, being present, curiosity, creativity, self-compassion, and sensitivity. Wouldn’t that make for a transformational 2013? And while we’re on that subject…Happy New Year! Mmm, liking the idea of being classmates together there Julie. I’ve been doing a lot of soul processing throughout the month of December, which culminated in the creation of a mandala which expressed my deepest desires and the conditions for manifesting them. To my great surprise, one of the conditions was “suspend.” As in, suspend control. Suspend judgment. Suspend the idea that I know what’s going on. Suspend worry. As you can imagine, this post truly resonated with me. Thank you! Would love to see your mandala Charlotte. “Less” is a word that’s coming up for me, not unlike the version of “suspend” you speak of. Yeah, kind of like a secret school for those of us who want that different life, Maryse! Sounds like you have wonderful centering practices, Carol. This was a nice post to land on today. It reminds me to appreciate my life and those, like you, who encourage me to look deeper and find the parts of me that are calming and have stood the test of time:~) Thanks, Patty. I like that Sara – stood the test of time. Good for all of us to remember. What beautiful words of wisdom! Thanks for sharing! Oh, Patty. I just love this. I have walked alongside loved ones facing major challenges in the past few years and the major lesson for me has been learning to let go of that which I cannot control. I am so grateful that these experiences taught me the importance of living with no regrets…of loving deeply and bravely even when it gets really rough. 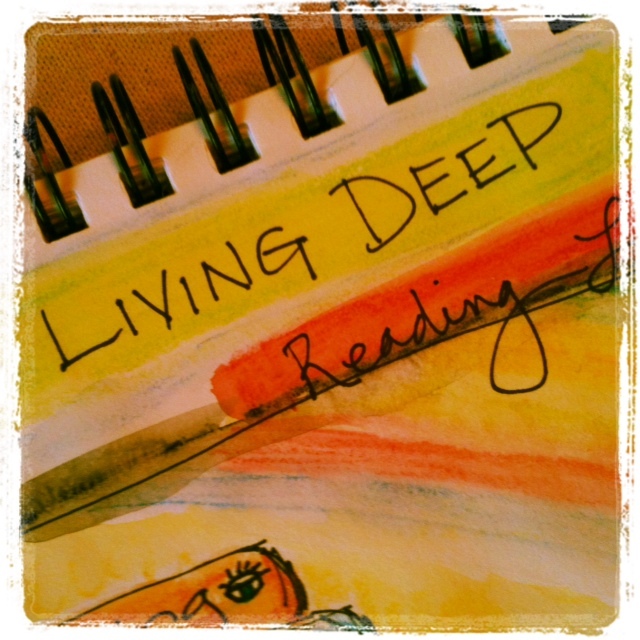 I love your journal page…what a great reading list! So nice to hear your story, Janice. There’s so much wisdom in the lesson your mention.